Giuseppe Sciuti (1834–1911), The Victim (The Christian Martyr) (1895), oil on canvas, further details not known. Wikimedia Commons. With few exceptions, such as the Pre-Raphaelites, nineteenth century painting is portrayed as centring on the city of Paris. For example, those Italian artists who are better-known, like Giuseppe De Nittis and Giovanni Boldini, only seem to have attained fame when they lived in Paris. My discovery for today is Giuseppe Sciuti (1834–1911), who not only doesn’t seem to have got to Paris, but was born in the shadow of the volcanic Mount Etna on the Italian island of Sicily. Sciuti started his art studies locally at the age of fiteen, then went to the nearby city of Catania. He progressed from the workshop of a scenery painter, to that of a decorative artist, until he finally came to work in the studio of Antonino Gandolfo, a notable social realist and portrait painter. Just as he was hoping to make the break to Florence or Rome, his family’s farm was destroyed by one of Etna’s eruptions, and he had to spend the next eleven years working for a decorative painter instead. It must have been in the mid 1860s before he eventually travelled to Florence, where he painted his first mature works. Towards 1870, he went to Naples, where his paintings met with critical success. He then made a mixture of history paintings showing notable events in the development of the Italian nation, and wonderful depictions of classical Greek and Roman times, which are of a quality comparable to those of his contemporary Jean-Léon Gérôme. Giuseppe Sciuti (1834–1911), Pindar Recognises a Victor in the Olympic Games (1872), oil on canvas, further details not known. Wikimedia Commons. 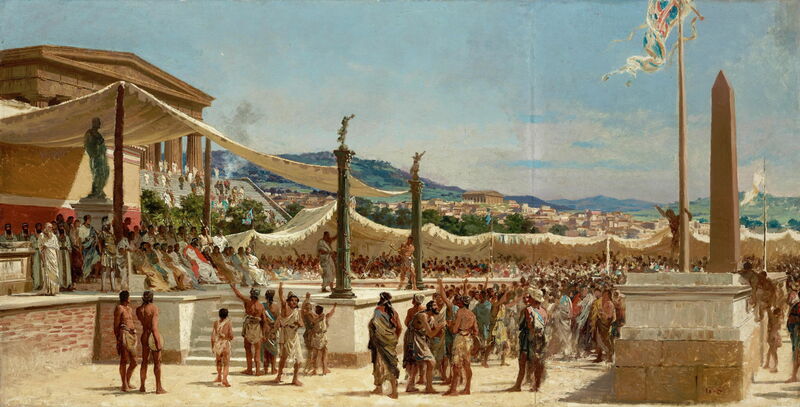 Sciuti’s Pindar Recognises a Victor in the Olympic Games (1872) was exhibited at a National Exhibition in Milan, and the following year won a medal at the World’s Fair in Vienna. Pindar the great lyric poet stands, no doubt in the middle of reciting one of his ‘victory odes’, to the left of centre, and the victor wears a laurel wreath and red cloak. Sciuti has a great eye and brush for fine detail, and his choice of spectators breathes life into the scene. 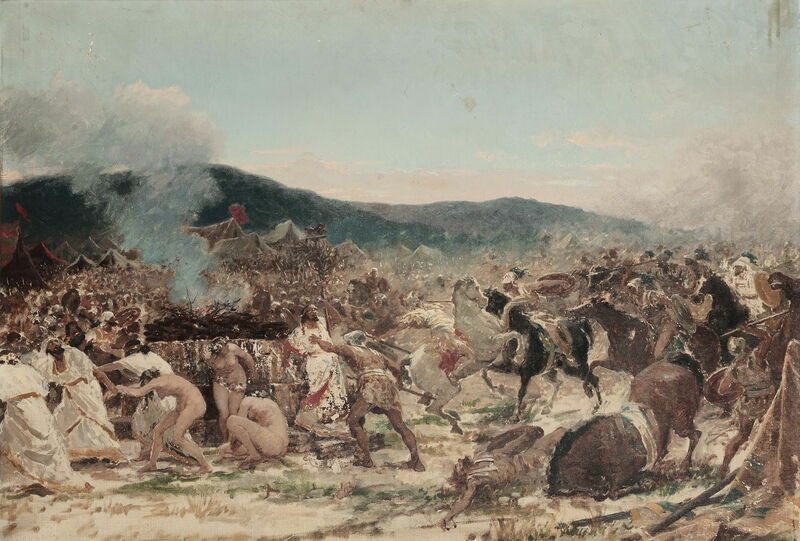 Giuseppe Sciuti (1834–1911), The Battle of Himera (1873), further details not known. Wikimedia Commons. The Battle of Himera (1873) shows one of the battles in the Sicilian Wars, fought in about 480 BCE between Gelon, the Greek king of Syracuse, Sicily, and Hamilcar of Carthage. This is claimed to have coincided with the naval battle of Salamis, and/or the Battle of Thermopylae, and has been eclipsed by both of them. This painting appears to be a late oil study for the finished work, still very painterly in passages, and is perhaps the more atmospheric as a result. Sciuti’s finished painting was exhibited and sold in London in 1888, but seems to have vanished without trace. Oh – and the Greeks won, inflicting heavy casualties on the Carthaginians. Giuseppe Sciuti (1834–1911), The Funeral of Timoleon (1874), further details not known. Wikimedia Commons. The Funeral of Timoleon (1874) was another well-received painting which was bought by the city of Palermo. Timoleon was a great Greek general, who was formative in the history of the Greek colonies in Sicily, particularly the city of Syracuse. Sciuti here outdoes Gérôme’s spectacular recreations with his vast crowd and wide-screen vision. Timoleon’s funeral pyre burns in the right foreground, ready to cremate his body when it has been carried from the other side of the forum. 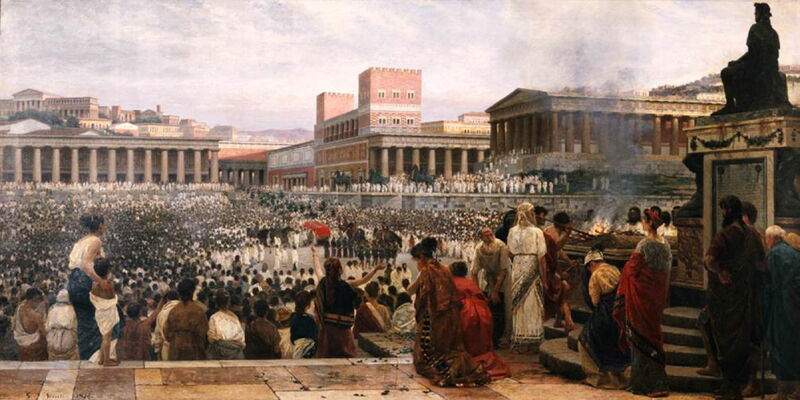 In 1875, Sciuti moved from Naples to Rome, where he was soon successful in a competition to paint two historical works for the province of Sassari, shown below. Giuseppe Sciuti (1834–1911), The Temple of Venus (1876), oil on canvas, 50 x 66 cm, Galleria Nazionale d’Arte Moderna e Contemporanea, Rome, Italy. Wikimedia Commons. Sciuti also painted scenes which are reminiscent of the contemporary works of Lawrence Alma-Tadema in Britain. 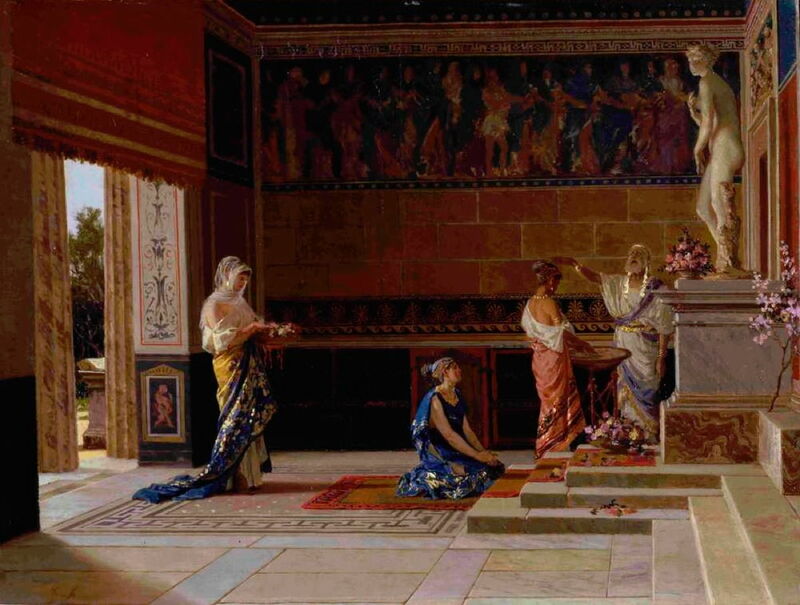 The Temple of Venus (1876) is a good example, with its careful attention to details of costume and decor. 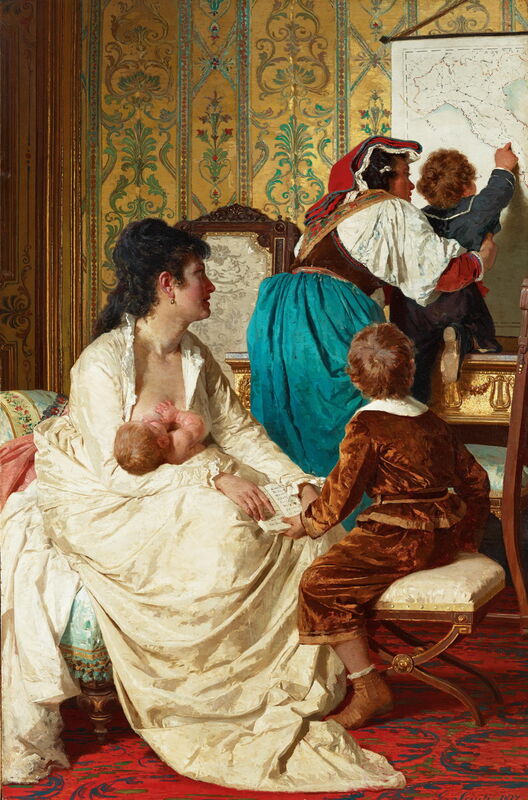 Giuseppe Sciuti (1834–1911), The Joys of the Good Mother (1877), further details not known. Wikimedia Commons. Over this period, he painted some domestic and genre scenes, such as this marvellous depiction of The Joys of the Good Mother, also known as The Geography Lesson, from 1877. Three children from a close-knit family are seen feeding at mother’s breast, learning to read with her, and (with the assistance of a nurse in traditional dress) learning about their country. 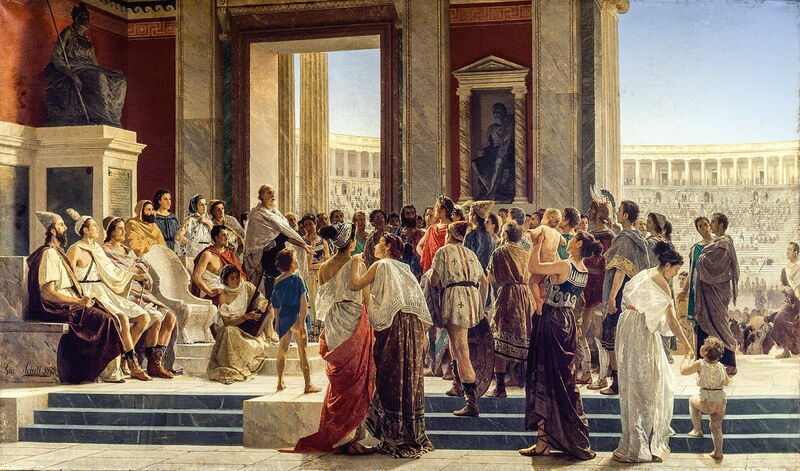 My first encounter with Sciuti’s work came through this spectacular painting of Titus Quinctius Offers Liberty to the Greeks from 1879, which features in one of my articles about Plutarch’s Lives. Sadly I can discover nothing of its history, but it shows the moment that this Roman governor of Greece gives freedom to its people, and guarantees them from the threat of Macedonian invasion. Giuseppe Sciuti (1834–1911), Proclamation of the Republic of Sassari (The Council of the Republic of Sassari) (1880), fresco, dimensions not known, Palazzo della Provincia, Sassari, Italy. Wikimedia Commons. Sciuti’s two paintings for the province of Sassari tell a little fascinating history of the Italian island of Sardinia. In 1284, the city of Sassari became the first and only independent city-state of Sardinia, joining more famous city-states such as Florence on the mainland. Proclamation of the Republic of Sassari (The Council of the Republic of Sassari) (1880) is Sciuti’s fresco in the Palazzo della Provincia, Sassari, showing his re-imagining of the moment of creation of that city-state. Giuseppe Sciuti (1834–1911), The Entry to Sassari of G.M. Angioy (1879), further details not known. Wikimedia Commons. Subsequently, Sassari came under Austrian rule in 1708, following which it was ruled feudally by the House of Savoy. 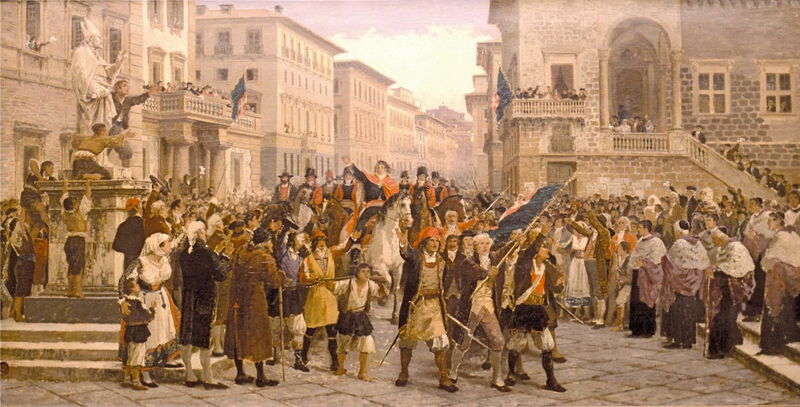 In 1795, the Emissary of the Viceroy, Giovanni Maria Angioy, led an uprising which restored Sassari’s independence. The Entry to Sassari of G.M. Angioy (1879) shows the Emissary entering the city in 1796, when he was greeted not as the administrator representing its landlord, but as a liberator. Angioy placated the revolt, demanded an end to the feudal system, and refused to collect taxes. He remains a national hero. Then appears a long gap in Sciuti’s works: he still seems to have been active and successful, but his paintings from that periods have vanished. 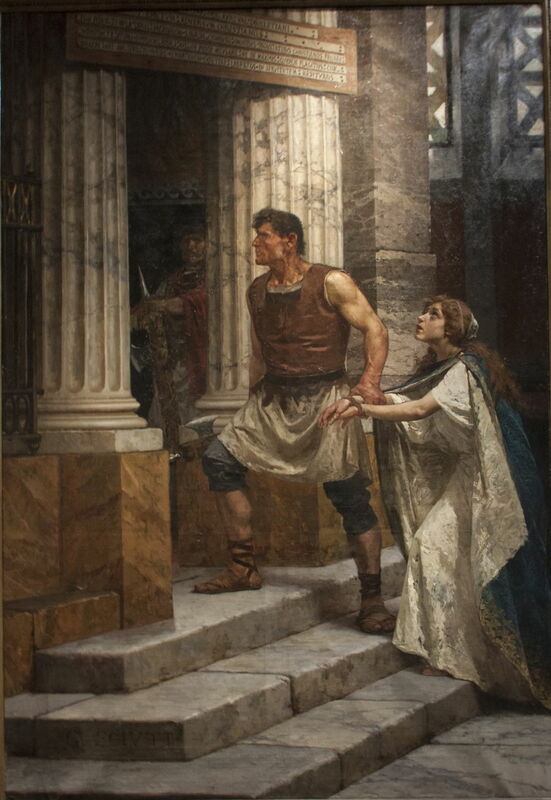 In 1895, Sciuti continued with his classical Roman theme, in The Victim (The Christian Martyr), which shows a young Christian woman with her wrists bound being led to her eventual death: the man leading her and the shadowy figure inside the entrance are both holding the fasces (bundles of rods with an axe) indicating that they are lictors, the guards and officers of a magistrate. The following year, Sciuti was commissioned to paint the ceiling of the cupola in the Basilica della Collegiata of Santa Maria dell’Elemosina, in Catania, Sicily. Images of this are fragmentary, but suggest the magnificence of this late work. Giuseppe Sciuti (1834–1911), Title not known (1898), fresco, dimensions not known, Santa Maria dell’Elemosina, Catania, Italy. Image by Giovanni Dall’Orto, via Wikimedia Commons. 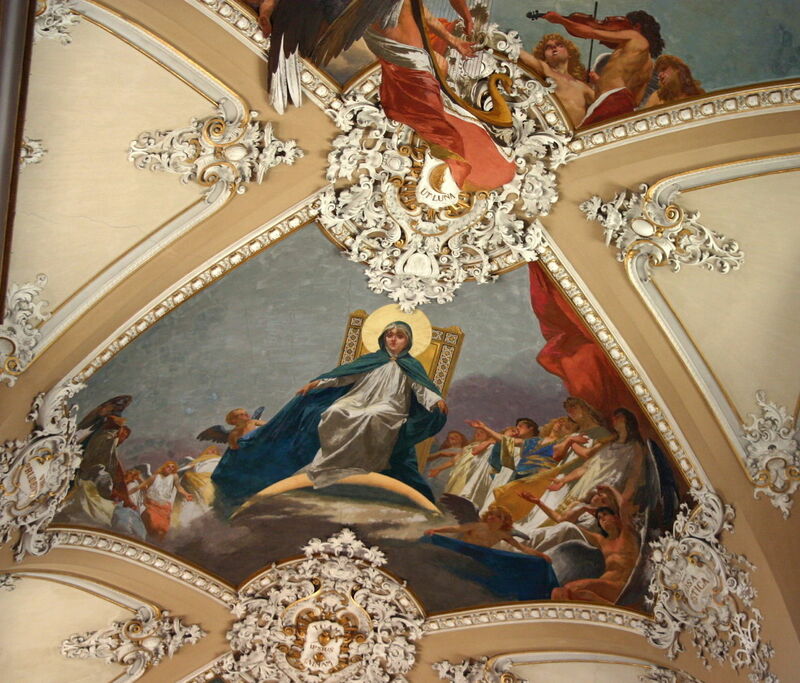 This section of the ceiling shows ‘Saint Mary of the Alms’, with Mary sat on a throne, surrounded by the poor. 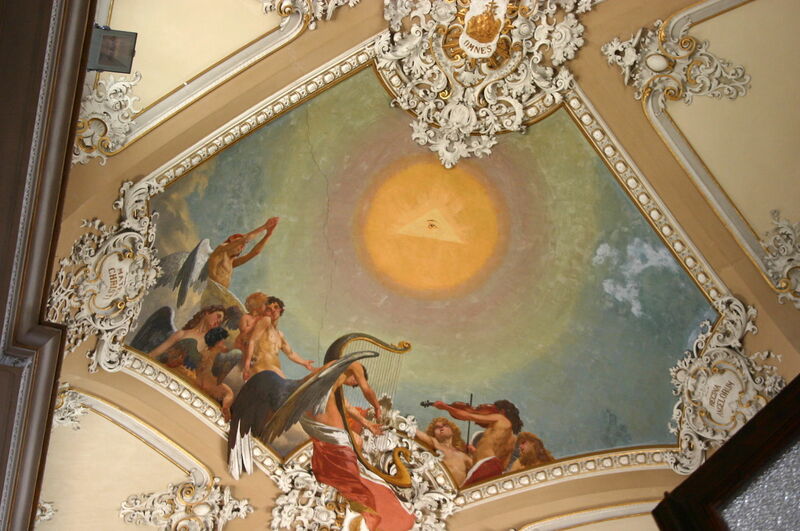 Opposite that is a small group of musicians with angels, and above them is the unusual image of the Eye of (divine) Providence, or the ‘all-seeing eye of God’. This is set inside a triangle, representing the Trinity, in a symbol which appears in much older paintings, such as Jacopo Pontormo’s Supper at Emmaus of 1525. Sciuti continued to paint until at least 1907, but in 1911 died in Rome shortly after his seventy-seventh birthday. Posted in General, Life, Painting and tagged Alma-Tadema, Gérôme, history, Italy, narrative, painting, Sardinia, Sassari, Sciuti. Bookmark the permalink.